Here at Golden West Exteriors, we offer many contracting services in Edmonton, including roofing, siding, windows and doors, and more! We are of the mind that a company should stand by the quality of their work (especially contracting companies), and that is exactly what we do. We encourage all potential customers to reach out to our previous clients, or check out our reviews and rewards to come to their own decision. One of the many contracting services that we offer in Edmonton is skylight installation and repair. 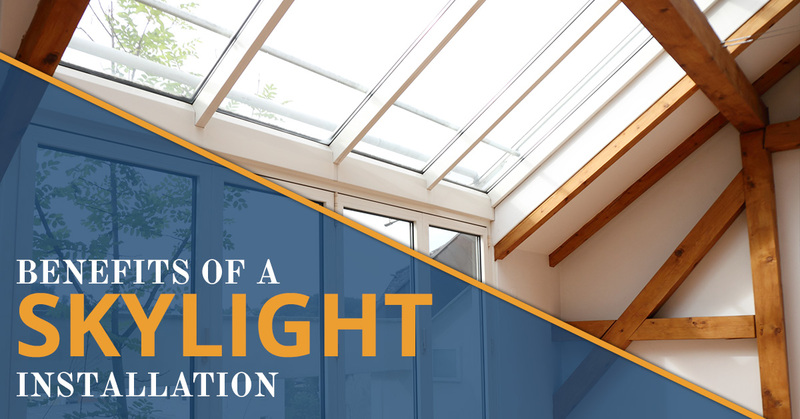 If you haven’t considered having a skylight installed, there are plenty of advantages that you could reap. We go over some of them here. Why waste money on light indoors when the sun provides it for free? Adding a skylight into a high traffic room can eliminate the need to use electricity for light for well over half the day. This can have huge environmental impacts. Because solar energy is unlimited (most of the time), it does not create harmful emissions, and does not require infrastructure to transport. By using sunlight instead of artificial lighting, you are taking all of these stresses off of the environment. Of course, you may also be saving a sizable chunk of income on your energy bills as well. It is always nice to find a win-win situation! Not all light is created equal, and constantly being bombarded with artificial light can have some weird effects on our brains, especially regarding our circadian rhythms. Getting a skylight won’t solve all of these problems, but it does address some of them. For instance, natural light just looks better than artificial light (if you have ever walked into a Walmart or Target and felt like you’re caught in a strobe like stuck on flash, you know what we mean). It is also the light that our bodies have evolved their circadian rhythms around, so even if you still keep the electronics on at night (their blue light a major factor in insomnia cases around the world), your circadian rhythm will be less affected than with no natural sunlight at all. Finally, natural sunlight tends to light spaces more evenly, and more fully. As people get older, they tend to need two or three times as much light just to see as they did when they were younger. Natural sunlight helps reduce glare and light a room evenly, which can improve the mood of any room. We already mentioned that you can lower your monthly energy bills by having a skylight installed. But you may also be able to make use of tax advantages or tax credits with certain skylight brands. This would be up to the resident to take care of, but it never hurts to do a little digging when you can save some money! Certain skylights, known as electric venting skylights, can actually open to produce what is called a passive air conditioner. This creates an exhaust effect, where rising warm air is vented through the skylight, cooling the entire home while also circulating fresh air into the house. For people that love fresh air, this is a great home renovation option. It can also help people who suffer from both allergies and asthma. People who do not have skylights often rely on opening their windows to get some natural light in their home. This is fine if you are an open book, but some people prefer to maintain their privacy. That shouldn’t mean they have to suffer in darkness or artificial light, though! By installing a skylight, you can get all the natural light in a room you could ever need, without sacrificing a bit of privacy! This one does not seem to fit in, but adding in a skylight can actually help you fight mold and mildew in your home. Both build up in wet or damp areas, but artificial light does nothing to stop their growth. Natural sunlight, however, has disinfectant properties that make it much harder for mold or mildew to grow. Before you ever have a skylight installed, it is important to make sure you are using a knowledgeable and respectable contracting company, like Golden West Exteriors. Skylights are notorious for leaking when improperly installed, and there is always a chance for damage even when they are installed properly. Another problem can come up when skylights are installed in improper locations. For instance, a skylight facing west that do not have shades or blinds installed may quickly heat up a home beyond a comfortable level. When considering a contractor for skylight installation, find someone who is willing to take the time to walk you through all of your options, and go over how they affect you in detail. Have we piqued your interest in skylights? If you are considering one for your home, Golden West Exteriors is the company to call for skylight installation in Edmonton. We also perform skylight repairs in Edmonton, so you never have to worry about the health of your skylight and home when you get one from us! For more information about our skylights, and how they can benefit your home, please do not hesitate to give us a call at your earliest convenience. One of our friendly and knowledgeable representatives will be happy to answer any questions that you may have.